Confronted with the problem of students who were often unable to visit a museum during the semester, Karen Shelby discussed the merits of using video to bring the museum into the classroom. Here, I will address pedagogical concerns, but from the perspective of a museum curator. I think that that employing curatorial strategies in the classroom can bring students to a fuller understanding of the objects taught (often via digital reproductions) in an art history course. Of course, Art History concerns itself with theory and the history of its own making, but concentrating on the fundamentals of curatorial practice can enliven the classroom and offer students a way to understand how the academic skills they learn are employed in real-world scenarios. Successful curating, like teaching, hinges on two key elements – content and delivery. Within the museum, the works on display and wall text form the basis of content. In the classroom, content mirrors the museum setting: what images do we show (the works) and how do we explain them (wall text)? With relatively little that distinguishes content, delivery in both museum and classroom settings – even as much as one’s explanatory or methodological approach – becomes the main driver of communicating the essence of a work to the viewer or a student. ‘Delivery’ in the museum might include: the type of exhibition; object placement; the checklist (equivalent to the Powerpoint, but with loan forms); even design elements, down to vitrines and lighting also effect reception. Adapting these motifs to the classroom could take the form of: rethinking a lecture’s theme (perhaps given over entirely to a single-artist); resizing images so that they accurately approximate the object in question (this can be extremely liberating); selecting just 3-4 objects for break-out sessions (akin to the practice of highlighting a particular artist within a group exhibition); and trying to recreate something of the historical setting – what I call in situ teaching. This can be something as simple as teaching Stonehenge in a circle, walking beside the screen to illustrate how a viewer would experience the Contarelli Chapel, or pointing out an actual post and lintel (“they’re everywhere!” my students would tell me) instead of a reproduction. Think of the last time you covered the Basilica of San Vitale. 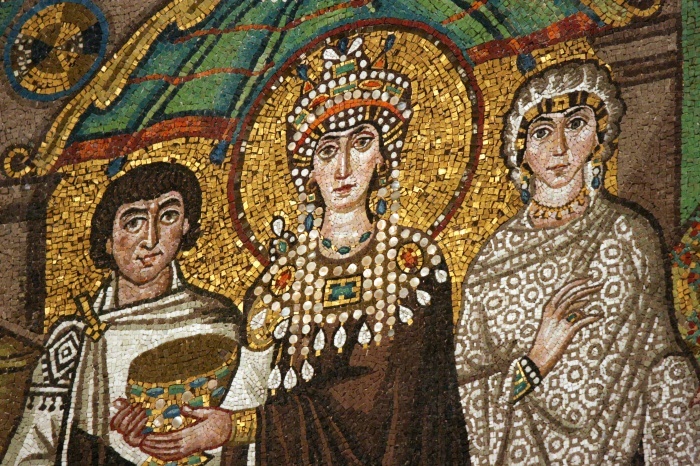 When I last taught the work, there was a lively discussion of Justinian’s Christ-like appearance, and we considered the (potentially) gendered segregation of Theodora, who (perhaps) waits outside the church, or (alternatively) is depicted more triumphantly than her counterpart, perhaps due to her role in suppressing the Nika riots and, quite possibly, keeping the empire under Justinian’s rule (thus saving the basilica). Of course I noted that it was all propaganda, and neither Emperor nor Empress probably ever stood at the site. But—think about that for a moment, about standing at the site. Did your classroom feel anything like basilica? Was it dimly lit, with students sitting at desks arranged in a tidy grid and a podium off to one side of the screen? The room almost certainly was nothing like the basilica itself – of course, it can’t be. But, how do we turn our classrooms into something a little bit more like the site? This question, of bringing the site to the space in which we teach presents the crossroads where the classroom can become a curatorial space, but where it often does not. Consider, for example, the slew of decisions that go into exhibition planning: in terms of design issues alone, one has to consider what the vitrines will look like, how many walls should be installed and at what angle, what color the walls will be painted, all of which influence our reception of the objects on display. When we teach, how do we recreate something like the Basilica of San Vitale? We can’t bring the actual mosaics into the classroom, but we could bring a mosaic. We can’t hold mass (let’s not even consider the wide range of political ramifications that might sprout from such an enactment) but we can light some candles and burn some incense (no, I’m not advocating that type of experience). But, the key here is to find just that – experience. Art at its best is devastatingly experiential. And while some art purports to take us to somewhere else, much like the landscapes of the Song dynasty stood in as outlets for those at court who could not wander amidst the craggy landscape, a great swath of art from across time demands a situational experience to be wholly understood. The quality in question here is the period eye, wherein our cultural framework constructs our reception of art. And as digital media reigns in the classroom, the theories of Baxandall to Benjamin and Baudrillard (that span the interregnum from digital reproduction to simulacra) reinforce the need to teach beyond the object. Curating the classroom means creating an activated space, a space that begs the professor to perform for the absent object. Curating the classroom is a strategy to activate an increasingly fragmented space and recreate the historical conditions of reception. Doing so can re-frame what makes art history compelling – no one really enjoys abstruse historiographical polemics, but we all like a good story.